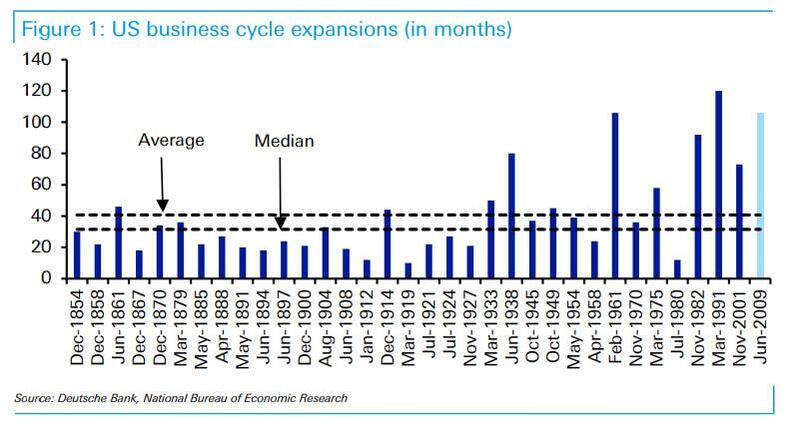 In our broad discussion about the inevitable turning of the credit cycle yesterday, we noted that the current expansion is now the second longest in US history and will become the longest if it survives another year, even as investor concerns grow that 2020 is the year when the next recession finally hits, with some starting to take proactive measures. Still, according to some the recession risk remains somewhat overstated. Take for example, Goldman, whose recession model, which uses economic and financial data from 20 advanced economies to estimate recession odds, puts the probability of recession at under 10% over the next year and just over 20% over the next two years, below the historical average, while the bank's recession risk dashboard — a collection of the most valuable leading indicators drawn from our research and academic studies—also continues to send a comforting message. would become more likely if the Democrats take the House of Representatives in the midterm elections." Tightening in financial conditions: while so far financial conditions have remained remarkably loose, Goldman expects that the recent tightening in financial conditions "should begin to slow growth later this year and through 2019, and the additional rate hikes we expect that are not yet reflected in market pricing would imply further tightening that would slow growth into 2020. These first two factors are worth a total of roughly -¼pp in 2020" as shown in the chart below. Labor market constraints: the third key negative factor is that the natural deceleration from tighter supply constraints as the labor market moves further beyond full employment is worth another -¼pp to GDP. Taken together, these effects suggest a growth rate roughly ½pp below potential, resulting in Goldman's 1.25% 2020 GDP forecast as shown in the chart below. Historical consensus growth forecast errors a bit more than a year ahead suggest a roughly 25% probability of a 1.25pp downside miss. This implies that a recession, at least a technical one, is much more likely in 2020 than over the next year, but not the base case. Goldman then touches on two additional topics that have gained prominence in recent months as potential recession catalysts, namely trade war and foreign spillovers, in an attempt to downplay the potential impact from each. 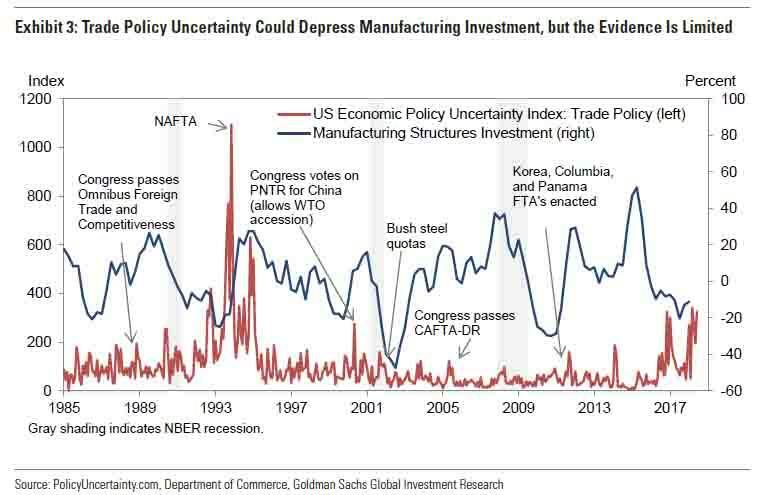 As a tangent, Goldman also looks at the overall Economic Policy Uncertainty Index, which while still subdued, the same can not be said for its trade policy component—which is quite elevated. However, here the bank notes that in the one previous episode in which the trade policy uncertainty index truly spiked, during the NAFTA negotiations in the early 1990s, investment in factories dropped off temporarily, but overall investment was not unusually low. Here it is worth noting that Goldman discounts the potential impact of Smoot-Hawley - an example of a major trade war - on the Great Depression, although it does admit that "tariff-related fears appear to have contributed to the stock market decline." What about the risk of "foreign spillovers", which is just another way of calling emerging market contagion, or - better yet - "importing a recession". Here too, Goldman is dismissive, noting that it sees "little risk so far: our global CAIs show that growth remains above potential in most of the world, and we remain cautiously optimistic on emerging markets. Historically the US has been fairly immune to foreign spillovers. According to our analysis of the historical causes of US recessions, it has been about a century since the US last “imported” a recession via weak global demand or financial contagion." Yet even here, Goldman concedes that the bigger risk than a mere EM economic slowdown, is contagion via financial channels, pointing to research that global equity markets in particular have become more synchronized in recent decades, largely due to co-movement of risk premiums. The surprisingly strong reaction of the US equity market to growth fears in China in late 2015 and early 2016 offered a reminder of this trend. How would this look in practice? Goldman's sensitivity analysts shown below lays out how a foreign slowdown coupled with a US equity market sell-off might affect US growth. 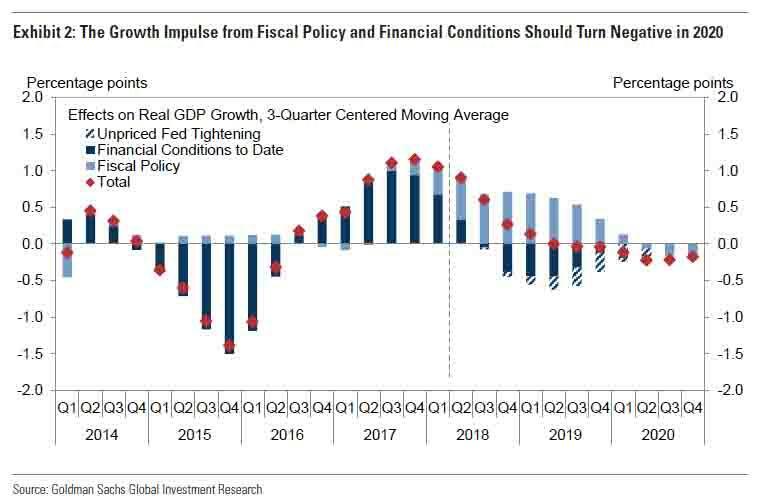 And while Goldman's estimates show that importing a recession would need to involve a significant equity market correction - something to the tune of a 30% drop in EM markets coupled with a 2.5% drop in EM GDP to slice off 2% in US GDP - it cautions that with its baseline for growth at 1.25-1.5% over the next couple years, "it would not take an extreme combination of events to knock the US economy into at least a technical recession." Incidentally, the bank also notes that its rule of thumb is that a 10% decline in the US equity market reduces GDP growth by about 0.5%. 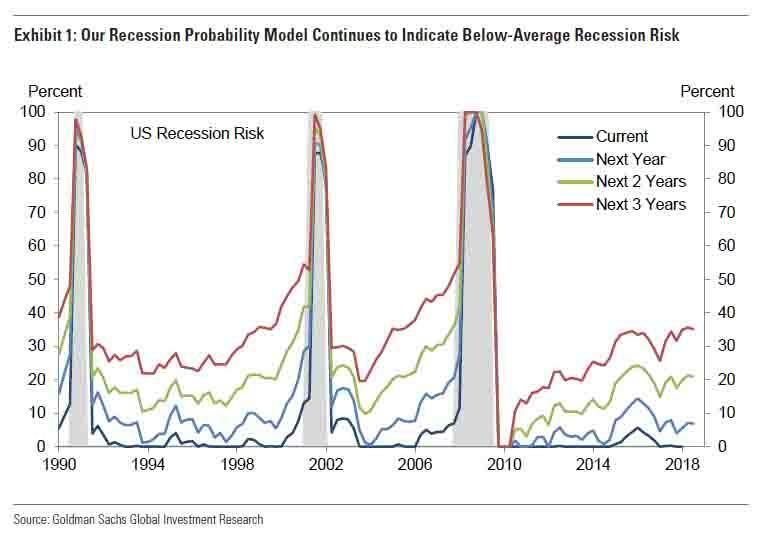 ... what are the major recessionary risks, in Goldman's view. The answer: there are two, both of which are completely home-grown, and are a function of the Fed's policies: the textbook "recession from overheating" and what Fed Chairman Powell has called the “financial excess” variety. In regards to the potential of the US economy overheating, Goldman writes that "overheating recessions have occurred historically when the economy moved past potential, a tight labor market boosted wage growth, and elevated demand caused energy and other commodity prices to spike, leading to accelerating inflation and an aggressive tightening response by the Fed." And while Goldman says that it wouldn’t downplay this risk too much - "after all, we expect the unemployment rate to fall to its lowest level since the Korean War next year" - it notes that overheating risk is straightforward to monitor and looks limited for now. Meanwhile, as based on the Fed's own imprecise metrics, core inflation remains below target, as does labor cost growth, and both household inflation expectations and market-implied inflation compensation are below average, "but going forward, both a historically tight labor market and the trade war pose upside inflation risks." Not surprisingly, Goldman is complacent here as well, writing that its financial excess monitor tracks both elevated valuations and risk appetite in asset markets, as well as financial imbalances and vulnerabilities in the household, business, banking, and government sectors, whose combined resulted are shown as a heat map in which blue indicates restraint and red indicates elevated risk. The main reason for Goldman's lack of concern is that the four main zones of risk which were flashing red in 2007, namely the housing and commercial real estate markets, as well as household and financial business debt, are seemingly far more subdued now than they were in 2007. 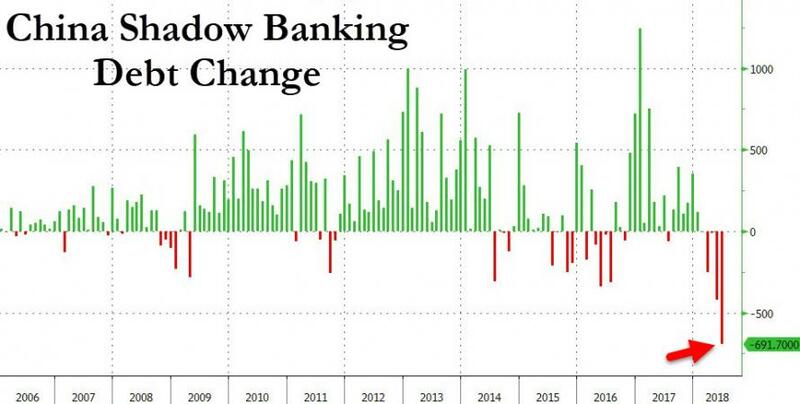 Of course, the main trigger for this is the lack of high interest, which in turn is a function of emergency monetary policy and bloated central bank balance sheets, but for some odd reason, this did not make Goldman's risk heatmap. The expansion is now just a year away from becoming the longest in US history. The good news is that age alone has not been a great predictor of recession risk, and that in any case the age of this expansion looks much less extreme when compared to the broader set of post-war developed market business cycles. In addition, we have some important advantages today, including both a lack of financial imbalances and monetary policymakers who have benefited from the lessons of past cycles. With job creation still running at double the breakeven pace, the unemployment rate—already ½pp below our estimate of the sustainable rate—is likely to fall significantly further." This is a major problem for the Fed, which is already facing a record low, 4% unemployment, because for the expansion to continue "for many years", the Fed will first need to stabilize the unemployment rate and "eventually to nudge it somewhat higher without setting off a recession." This is certainly possible in principle, but it is something that the Fed has never achieved before and in fact that few advanced economy central banks have achieved. The further the overshoot extends, the longer the economy will have to operate somewhat below potential to return to a sustainable place. This, to Goldman, "implies an increasingly narrow runway for a soft landing", which coupled with an identical outlook facing the slowing Chinese economy, puts the odds of a near-term recession far higher than the S&P500, which closed above 2,800, would suggest.